John Tiedemann was born in New York City in 1906. His father passed away when he was three years old, so he and his family moved from NYC to Jersey City, NJ. He dropped out of school in 6th grade and went to work at a foundry to help support his widowed mother. Even though he was working at a foundry, at the young age of 12 he had bigger things in mind. By the age of 13, he self-educated himself in the field of electricity by reading everything he could. At 13 years old he owned his own electrical contracting business with five employees. They were converting gas lit houses into electrically lit houses. John married Julia Melvin in 1921 at the age of 15; they went on to have 13 children, 11 boys and 2 girls. When John was 20 years old, he saw an opportunity to move forward with the times. He self-educated himself again, this time in the field of converting coal furnaces into oil burning furnaces. Realizing quickly that there was going to be a demand for oil, he wanted to start an oil delivery service. His wife was against him being put into debt to buy the trucks, so he sold his business to a company, which today is called Efficiency Oil in Jersey City, NJ. During the Depression, when work was hard to find, John got a job working on a merchant marines ship. He traveled all over the world learning about different cultures and architectures. When he returned home, he found a job working at St. Michaels Church in Jersey City, for Monsignor McWilliams, who recognized John’s talents immediately. Monsignor had John build an addition onto St. Michaels Parish School and also a gymnasium. In 1953, Monsignor McWilliams approached John with a problem, which he had done many times before. John was always able to come up with a simple answer to these problems. The church needed painting, but they could not afford the scaffolding to access the high ceiling. John thought about this problem for a few days, and began to research constructing equipment to access the ceiling. His idea was to construct a boom in the style of equipment sign installers were using at the time. He needed to construct this machine in a smaller, lightweight version, with no counter weights. Therefore, he developed an out-rigger system, everyone he took the idea to told him it would never work, but John’s determination did not end there. He found a company to construct the boom for him based on his specifications. He purchased a 1947 “ Willie’s Jeep” to mount the boom onto and attach his out-rigger system. The machine was finished in late 1954 and was tested for a few months before being put into use. Although everyone he discussed this idea with, including engineers told him that that this would never work, John was sure that it would work, and it did work, it even exceeded his own expectations. In 1955 he painted his first church, St. Michaels in Jersey City. 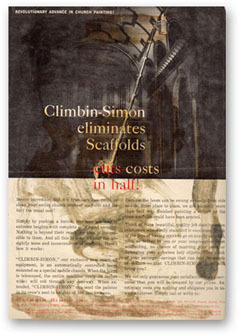 The company went through many name-changes over the years, including Climbin’ Simon; and finally settled in 1964, for John Tiedemann Inc. 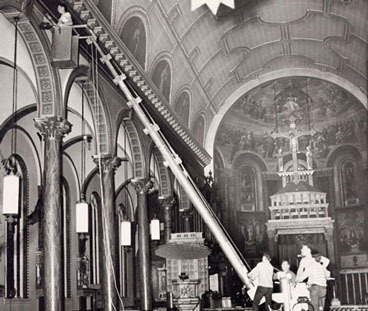 Since 1955, the company that John Tiedemann started, has manufactured three more booms for it’s own use, and painted and decorated more than 1500 religious buildings. Raymond Tiedemann, one of John Tiedemann’s 54 grandchildren, is now the president of John Tiedemann Inc., and runs all aspects of the company on a daily basis. The equipment that his grandfather developed is still in use, making it very convenient and cost-effective to paint and decorate churches. John Tiedemann Inc. has on its staff, a large group of designers, plasterers, painters, artisans, and fine artists. We now can supply services to accomplish a complete interior restoration from design to finish stages. Our expertise is unmatched in this field. Please take a look at some of our photos and see for yourself our level of quality.